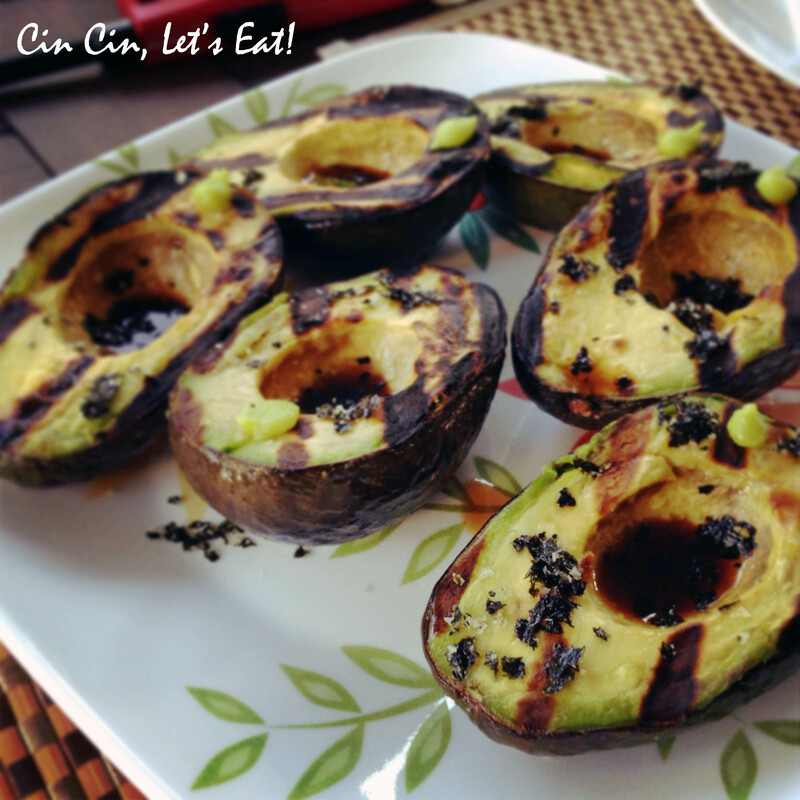 Grilled Avocado [recipe] – Cin Cin, Let's Eat! This last month has been quite the roller coaster ride, Spring is always the busiest time for us musicians/teachers. I have two days off so I’m being good, currently sitting here and cranking out all my long overdue posts. It sure felt like Summer this last weekend. We cleaned up our backyard, set up a brand-spanking-new patio dining set, and fired up the grill. We grilled up some teriyaki chicken with pineapple, sweet potato wedges, Vietnamese shrimp pops (post coming soon), and some AMAZING avocados. Most of you are probably wondering – “grilled avocados?” This genius idea has never occur to me either until I saw a restaurant review on Serious Eats (Izakaya at Daikaya). 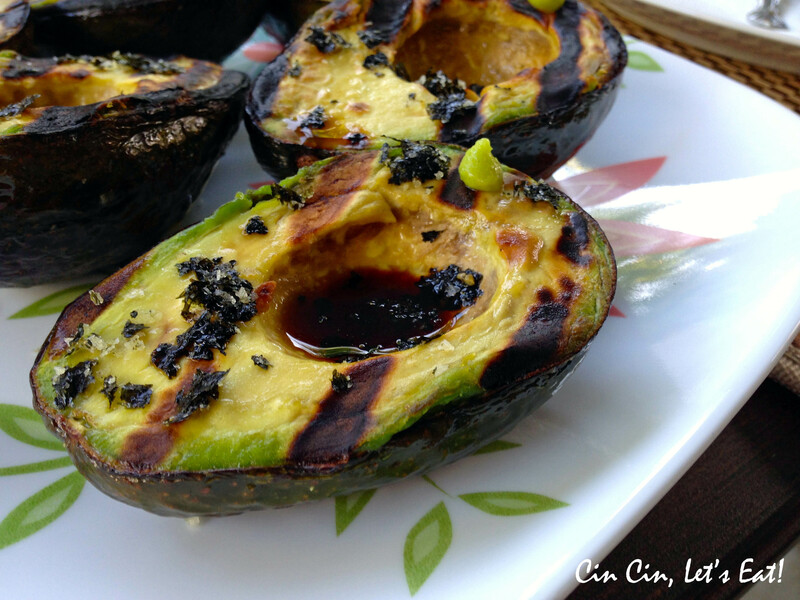 They grill the avocado halves, then a drizzle of ponzu sauce, with nori salt and wasabi on the side. It’s one of those dishes that had me salivating so much that I knew I had to make it immediately. Avocado goes well with Japanese flavors, and it’s in practically every sushi rolls here in the United States so I knew this was going to be a superb dish. Make shallow slits lengthwise and crosswise on the avocados, and brush with olive oil. Place avocado halves on the grill, over indirect heat, about 3 minutes or until you get some nice char marks. To serve: drizzle with ponzu sauce, a sprinkle of nori salt, a small drop of wasabi paste, and a spoon. Or you can have your guests add the condiments according to their own taste, it’s also more fun and interactive that way. *Ponzu sauce is widely available at most major grocery stores now. It’s like a citrus soy sauce. If you can’t find ponzu, just mix together equal parts of light soy sauce with lemon juice, with a tiny splash of rice vinegar. Ponzu sauce is not vegetarian as most of them contain fish stock, so beware if you are planning to serve this to vegetarians. *You can buy nori (seaweed) powder or flakes in Asian grocery stores. Or you can do what I did, which is buy a whole sheet of dry roasted seaweed for sushi (you can find this easily in the ethnic aisle of any major grocery stores) and tear them up to small pieces. Using a mortar and pestle, grind the seaweed pieces and salt together until you get a nice and coarse mixture. So smooth, custardy, and creamy!!! It was almost like eating an egg baked with cream. If you are an avocado enthusiast like me, definitely give this a try. The big plus is that it doesn’t get any easier, almost no preparation is required. If you want to get fancy, get a nice piece of sashimi grade ahi tuna and sear it on the grill. Thinly slice the tuna, drizzle with some ponzu mixed with wasabi and serve alongside the avocado. Green for spring! Love how easy the ingredients are to use in other dishes! Thanks for the tip on DIY ponzu. Btw, I just found a baked avocado recipe – cut avocado in half, crack an egg, top with bacon and bake.